The Missions Ministry at West Conroe Baptist Church is hosting their second Duathlon and 5K on April 5, 2014. The duathlon (5k run, 20 mile bike, 5k run) and 5k competive run will start at 7:30am. There will also be a fellowship 5K fun run/walk that will start soon after. **Please note that this is not a chip timed event, but we will have a race clock. 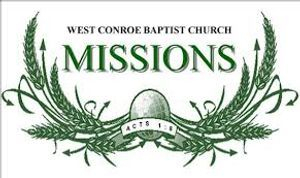 ** This event begins in the parking lot of West Conroe Baptist Church and takes place on the back roads of Conroe through rollings hills with some fast, flat roads as well. Snacks will be on hand before and during the race with water stations available along the routes and a delicious breakfast will be served afterwards to all participants at no additional cost. Registration is open now and may be done on active.com website or you may come into the church office to pick up a registration form. Registration is $50 for the duathlon and $30 for the 5K. Prices increase on March 29th to $55 for the duathlon and $35 for the 5K, so sign up today! Each participant will be guaranteed a shirt if registered by March 29th. On-site registration will be open at 6am the day of event until 7am, but no shirt is guaranteed. Booths from different local agencies will be on hand. Race will take place rain or shine. All proceeds for this race will benefit WCBC Missions Ministry to continue spreading the word of God around the world, across the United States, and locally in Montgomery County. Acts 1:8 says, "you shall receive power when the Holy Spirit has come upon you; and you will be my witnesses both in Jerusalem, and in all Judea and Samaria, and even to the remotest parts of the world."